Algae biofuels have the potential to become a renewable, cost-effective alternative for fossil fuels with reduced impact on the environment. Algae hold tremendous potential to provide a non-food, high-yield, non-arable land use source of renewable fuels like biodiesel, bioethanol, hydrogen etc. Microalgae are considered as a potential oleo-feedstock, as they produce lipids through photosynthesis, i.e. using only CO2, water, sunlight, phosphates, nitrates and other (oligo) elements that can be found in residual waters. Algae also produce proteins, isoprenoids and polysaccharides. Some strains of algae ferment sugars to produce alcohols, under the right growing conditions. Their biomass can be processed to different sorts of chemicals and polymers (Polysaccharides, enzymes, pigments and minerals), biofuels (e.g. biodiesel, alkanes and alcohols), food and animal feed (PUFA, vitamins, etc.) as well as bioactive compounds (antibiotics, antioxidant and metabolites) through down-processing technology such as transesterification, pyrolysis and continuous catalysis using microspheres. Microalgae are the fastest growing photosynthesizing organism capable of completing an entire growing cycle every few days. Up to 50% of algae’s weight is comprised of oil, compared with, for example, oil palm which yields just about 20% of its weight in oil. Algae can be grown on non-arable land (including deserts), most of them do not require fresh water, and their nutritional value is high. Extensive R&D efforts are underway worldwide, especially in North America and Europe, with a high number of start-up companies developing different options for commercializing algae farming. The demand for fossil fuels is growing continuously all around the world and the Middle East is not an exception. The domestic consumption of energy in the Middle East is increasing at an astonishing rate, e.g. Saudi Arabia’s consumption of oil and gas rose by about 5.9 percent over the past five years while electricity demand is witnessing annual growth rate of 8 percent. Although Middle Eastern countries are world’s leading producers of fossil fuels, several cleantech initiatives have been launched in last few years which shows the commitment of regional countries in exploiting renewable sources of energy. Presence of large tracts of non-arable lands and extensive coastline. Presence of numerous oil refineries and power plants (as points of CO2 capture) and desalination plants (for salt reuse). Extremely favorable climatic conditions (highest annual solar irradiance). 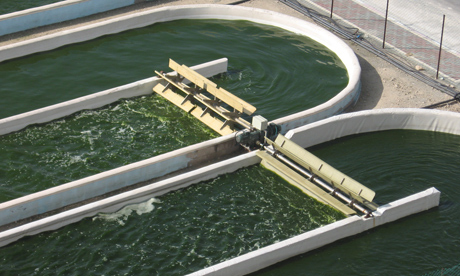 Presence of a large number of sewage and wastewater treatment plants. Existence of highly lipid productive microalgae species in coastal waters. These factors makes it imperative on Middle East nations to develop a robust Research, Development and Market Deployment plan for a comprehensive microalgal biomass-based biorefinery approach for bio-product synthesis. An integrated and gradual appreciation of technical, economic, social and environmental issues should be considered for a successful implementation of the microalgae-based oleo-feedstock (MBOFs) industry in the region.